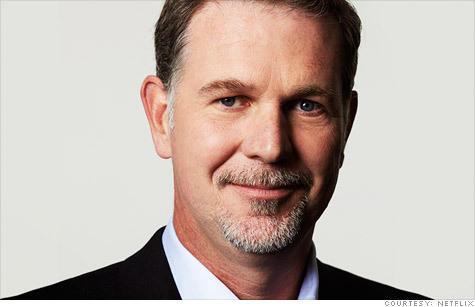 Netflix CEO Reed Hastings will be Facebook's sixth board member. NEW YORK (CNNMoney) -- Facebook nabbed one of the tech world's most admired leaders for a spot on its board: Netflix (NFLX) CEO Reed Hastings. "Reed is an entrepreneur and technologist who has led Netflix to transform the way people watch movies and TV," Facebook founder Mark Zuckerberg said Thursday in a written statement. "He has built a culture of continuous rapid innovation, something we share and work hard to build every day." Facebook created an additional board seat to make room for Hastings. He joins Netscape co-founder Marc Andreessen, Accel partner Jim Breyer, Washington Post Co. (WPO, Fortune 500) CEO Donald E. Graham, PayPal co-founder Peter Thiel and Zuckerberg. "I'm looking forward to working with Mark and the rest of the board to help Facebook take advantage of all the opportunities ahead," Hastings said. Facebook, which is preparing to hold an initial public offering by early 2012, has been bulking up its management team. The company recently hired former White House press secretary Joe Lockhart to run Facebook's corporate, policy and international communications groups.